Sudhir Sharma is a man of many facets: he is a designer, an entrepreneur, a teacher and a publisher. He is the founder and chairman of Indi Design, a rapidly growing brand and creative consultancy with offices in three countries and is best known for being a passionate spokesperson for design from India. Back in 2002 when the Internet was infiltrating the Indian landscape, Sudhir had the foresight to set up an e-group that for design professionals and educators. Design India went on to become one of the primary platforms for the debate and development of contemporary design practice in the country and despite the onslaught of social media, continues to draw a dedicated audience. Not stopping there, Sudhir has since turned publisher with POOL magazine, one of the few forms of Indian design media recognised by the worldwide community. In his avatar as a promoter of India’s design sector, Sudhir has been known to take a great deal of personal initiative, bringing his brand of persuasion to a wide variety of activities. At Perch we’re interested in knowing more about the man behind the persona, and the thoughts behind the actions that often leave the Indian design community deeply opinionated, but rarely indifferent. Here we embark on a freewheeling chat with Sudhir on a range of topics from publishing to government and books. PERCH: From being a designer to entrepreneur and now publisher of a leading design magazine, you’ve explored so many different facets of the design industry. Is there any one particular avatar that you’ve enjoyed more than others? SUDHIR SHARMA: I don’t differentiate them nor, are they separate blocks for me: that’s me all rolled into one. I feel more and more confident of having more of these avatars and less bothered about setting success mark first. Also, there isn’t much difference between them. Being a designer is being entrepreneur anyway. I am enjoying these multiple roles now since they give me a larger grasp of what we are dealing with. Being publisher and editor of POOL has in no way taken away from me being a designer at Indi Design. But I am Designer at first…other things I do to survive as a designer. PERCH: You were one of the first people to realise the potential of the Internet to form a design community when you founded the Design India e-group back in the early 2000s. Back then, what made you do it? SUDHIR: It always bothered me and still does today that designers are perhaps the most closed people, I must say Indian designers. It is also a fact that Design as industry is under developed. I could make this connection even then. We as industry will never grow if we don’t talk to each other and find solutions that are common. Every profession does that, but somehow Indian designers have extreme egos. They are not open and don’t really ask for help. When, in fact, they need it. PERCH: Over the years you’ve expanded the platform to include a directory, online resources and even social media pages. Do you feel it’s achieved its objectives? SUDHIR: Designindia has not become what it should, and many people talk about it. It could be much more but it needs time and resources. Best thing is I never had objectives for it, so it has been moulding itself. It became an ambassador of Design in India when we had conference in New York and a few conferences in India. It became a unifying mission when we supported and acted for the Design Policy in India, and recently it has been a job board. I have been open to the times and trends. It shouldn’t be something that gave you stress to act. PERCH: When you did start the DesignIndia e-group very few designers were online and now practically everyone has Internet access in some way or the other. Do you think that technology has had a positive impact on the way members of the design community interact? SUDHIR: Of course. In fact, technology is one thing that is bringing designers out in the open and making them react and interact. Earlier when I was building the group I used to invite fresh designers to join in. Now I leave it to them to find out and join. Technology has lowered boundaries and dimensions – people are seeing more and reacting more. PERCH: You’ve played an active role in representing design from India on international platforms and importantly, on the India Design Council as well. What has been your experience? SUDHIR: I feel the responsibility when I travel and meet people that they get the right picture of what and where design is in India. It is wrong for us to parade in design festivals as if design in India or europe or US is same. We have our own history, our own culture and in that sense we are very different. I have been an invitee on the India Design Council and my view is that the expectations of designers, IDC and government don’t match. There is a big need to harmonise the present level: we need everyone to come on board and understand where we are today and where we need to go. Designers expect the world and they should from the Design Council, because they have seen Design Councils in the world taking up that role. Design Council on other hand is a spin of Indian government in the hope that something can happen, so there is a name but not much else. All else depends on individuals. Individuals are there for many political reasons. So some work and some don’t. There are people who are pushing it to do what it can do and that’s the side I am very happy about. In India we are not open about these things, but I feel government needs to have more political will for design. That at present it doesn’t have. But like everything else, I feel some brilliant individuals are doing a great job at India Design Council and you will see some results. PERCH: As a professional designer, do you think that government organizations continue to represent the industry’s best interests? SUDHIR: Which government organisations? I think the agenda’s of the departments is different. I am a designer and I really don’t know what I can expect from government agencies, how can we expect a younger fresh designer to know? I think first the motives and motivations need to be made clear, then the process has to be prepared and then these departments should launch schemes. We do not have the culture of first investing time and resources and then launching programmes. After a programme is launched then the team has to go figure what to do and how to do it, so it’s really not by design. PERCH: Given the ever increasingly visibility for design from India, what role do you think India has to play in the global design agenda? SUDHIR: As of now, the world is fascinated by Indian crafts and design, because that is what design means to them in their culture: something that gives meaning to their culture. As Indian designers know that we have to go beyond craft: we still have to find our feet, before playing a role in global agenda. 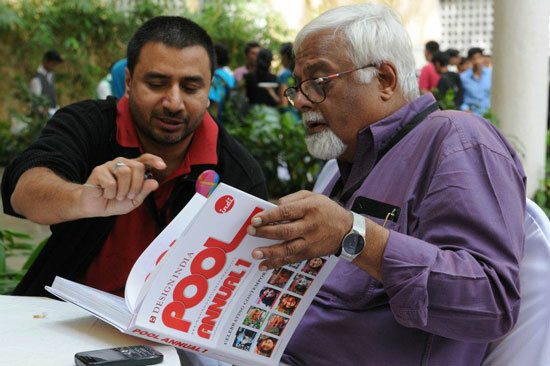 Sudhir with senior graphic designer Vikas Satwalekar at Typography Day in 2012. Photograph (C) Pradeep Goswami. PERCH: Do you think that design media will have a role to play in helping us find our feet? What does the scenario look like? 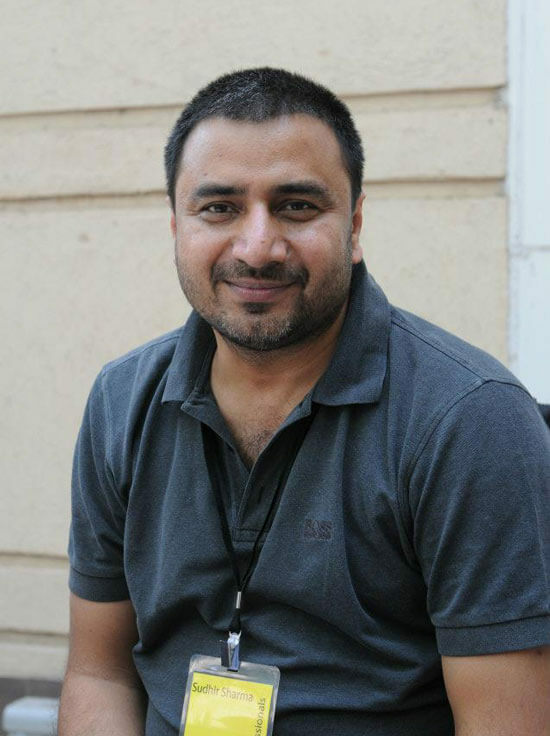 SUDHIR: There is hardly any media for Design in India, so it’s a green field. POOL is an investment into something that I love and hopefully it should work. Most design media is a dependent design media – sponsored, discounted, PR vehicles. It’s not professional yet, so we have time before we start calling a few blogs and few magazines a media. It is not surprising that a consistent effort can become a major player. But we have a long way to go before it establishes itself. I also feel it shouldn’t remain a trade media: it has to appeal to all and beyond designers. That’s where the challenge lies. PERCH: Speaking of media, a lot of attempts at critical writing on design have been met with sharp scepticism and defensiveness. It’s been said that the Indian design industry doesn’t appreciate the difference between critical writing and criticism. Do you think that’s a fair assessment? SUDHIR: I feel that Design is fairly a nascent Industry and it hasn’t matured to take any negatives as yet. Writing, on the other hand is very well developed so when people start writing about design they mostly ignore the context which is taken badly by designers. In Japan or Korea design has grown beyond contexts and can take critical writing in its stride. Anyway, we as Indians are touchy, we would rather hear anything than hear anything negative. You also start thinking about consequences and motivations. People have agendas and they are not always fair. PERCH: You’ve recently announced the India Design Festival for 2013. What is your vision for it? PERCH: And what do you make of the recent explosion in design events across the country? SUDHIR: That’s good. I think all noise is good at the moment. Some events are very good with a lot of creativity and inspiring enough to excite designers. Some are boring and serve no purpose. Most however, are aimed at Designers. So I don’t know what designers are supposed to take away from these conferences. I guess they land up learning how to make their language better or how to talk about culture and technology and design in one breath when they are actually struggling at home to get work. What’s needed is a wider range of the events, involvement of businesses, industry, government, media and normal people…that is a tough task and is missing. Even trade bodies are doing shows and awards with the aim of making money from designers…that’s a joke. PERCH: You’re a designer, an entrepreneur but also a teacher. What would you say to a young person looking to be a designer? SUDHIR: Design is perhaps the most fulfilling of carriers that you can have right now, it is challenging and it is rewarding. Design is also a very small global community. Don’t hesitate to ask for help and don’t think twice before helping someone to become a designer. PERCH: What inspires you on a daily basis? People. I am inspired by various people. People who lead companies, people who lead countries, people who do their job well and people who are totally into their work. Most people go about doing their work without bothering about tomorrow. Its how they do today’s work. PERCH: A little bit of wishful thinking: if you could have designed one thing in history, what would that be? I would have liked to redesign the temples/multiplex/shopping as an integrated traditional cultural place. PERCH: And lastly: if you were marooned on a desert island, what is the one book you would take with you? Thank you Ruchita. Eversince i started POOL..my worry was that i will never be interviewed now..other media will not write about me since i am a competition and how can i have my own interview in my own magazine…so i am glad its here. Thanks, Sudhir! We’ve corrected the mistake. It’s beautiful how design has got to the forefront now. I’d been closely connected to the India Design Forum and it was quite an experience. Maybe you should check it out too. I’m sure Sudhir will know about it.